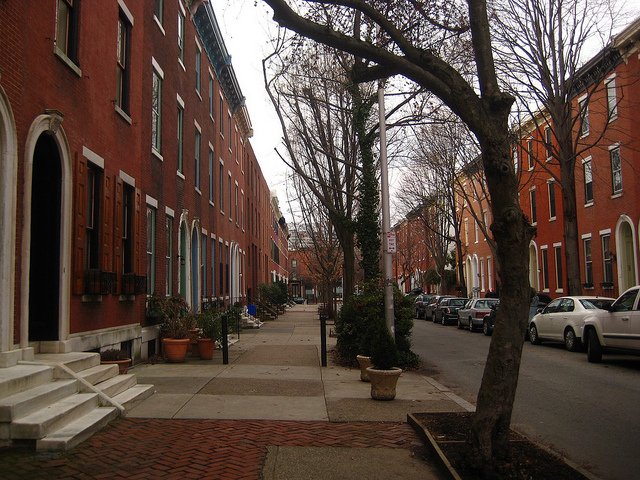 Don't let the empty streets fool you, Philadelphia was selected as one of the most walkable cities in the U.S. by WalkScore with a score of 74.1. Photo by Amanda Watson. Launched in July 2007, WalkScore rates cities and neighborhoods based on their level of walkability in order to promote sustainable communities. WalkScore’s work is inspired by the Sightline Institute, an independent non-profit that promotes sustainability in the Northwest. The idea behind the project is to map the least and most walkable neighborhoods in the U.S. to encourage walking as a primary mode of transport and to support design practices that create accessible and livable communities. According to this year’s ratings, New York scored the highest, 85.3, with its mixed-use neighborhoods, dense apartment buildings and integrated transport modes. San Franscisco was close behind with 84.9. Rounding out third, fourth and fifth were Boston, Chicago and Philadelphia, respectively. But the same rankings don’t line up with those created by public votes. According to WalkScore readers, San Francisco is the most walkable city and even Seattle is more walkable than New York. Want to have a say on the most walkable city? Cast your vote here. “A center: Walkable neighborhoods have a center, whether it’s a main street or a public space. To calculate the walkability rankings for 2011, WalkScore used 2010 population data from the U.S. census and neighborhood boundaries from Zillow. This data is used to add weights to walk scores by population density. In addition, WalkScore uses an algorithm that measures the walkability of individual addresses based on proximity to nearby amenities. Read more on WalkScore’s methodology here. How does your city rank? Find the answer here by typing your address.